Gregath has added several more full index to our free index offerings. These are PDF in format and searchable. 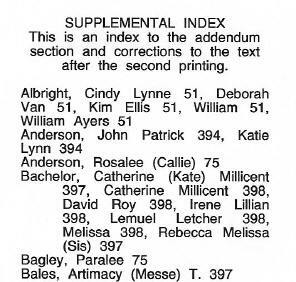 The goal of these free, personal use, indexes is to allow a reader to see if particular names are covered in books that are in print (various editions). These are found, by title, on our website. Feel free to link to these. Please do not save, print, or reproduce these in any way. New author page for Charles F. Harris, so you can shop all his books in one place. Not also, this page contains access to book indexes and other information previously not available at GCI online. Consider getting more social networking for the same effort: Did you know some online services interconnect? For instance, you can set a Twitter account to automatically post on your Facebook wall. Many blogs will also post to Facebook or Twitter. Sometimes basic mail merge has problems with cells that contain a dash (-) such as a plus-4 zipcode (74370-0505) – it refuses to print anything for that area, or switches to gobbledygook. Simple solution for zips – make a base cell for your code and a +4 cell for the additional numbers and when setting up mail merge don’t forget to place a dash between the tags. For small lists and rural areas, some just use the base zip, but that sometimes slows delivery. If the original work, for reprint, needs updating and it is preferred that new material be included within the original work, the copyright release being sought should indicate updating is expected or acceptable. Once the groundwork has been laid, decisions as to whether to insert new pages, leaving original pages untouched (except perhaps for renumbering), or updating an electronic copy should be made. Even if open ended, unlimited copyright release is given, it is never recommended original material be altered – much like cropping a photo for publication should not involve scissors on the original photo or negative. Technology has advanced sufficiently that original material never need be destroyed. Bar code: Symbol capable of being read by an optical scanner. Generally placed on back cover providing specific information about item. Binding: Folded sheets (signatures) or single leaves (pages) secured on one edge (spine) and protected by a cover. Placing your eBook in a keeper case, usually used for DVDs, gives you an outer cover, as well as a space inside for a small booklet. Copyright release can be anything from “sure, please keep this work in print and do whatever you want to with it” to very specific like “you may print 15 copies, with the attached disclaimer, but otherwise unchanged in hard cover with this publisher, at one time in the next six months, not to be used for profit”. Copyright release may require compensation in exchange for the release. Microsoft Office users may be comfortable using mail merge to personalize each and every mail piece. If not, with a little bit of effort, learning the tricks can pay dividends. Instead of a general form letter/card – each one can be personalized. The days of hand addressing or running labels you have to stick down can be a thing of the past as well. Mail merge everything into a PDF to be sure it all prints exactly the way you envision (no additional charge) or send along your Excel spreadsheet or Access database with your camera ready mail merge file for a small service fee. Have you jumped on the social networking bandwagon, but don’t think it’s worth the time? Consider choosing 1 social networking platform and take the time to learn how to really use it. Then, don’t over use it. If you begin to see results, you may choose to grow into another platform, etc. but just having a user account won’t do much good unless you make it work for you. Binding Edge: Edge of text block that is attached by sewing or adhesive binding, etc. Binding Margin (inner, gutter, or back margin): Margin where text block is attached: The distance between the binding edge of a printed page and the text area.